Hi Charles-André-Joseph-Marie de Gaulle (Nobyembre 22, 1890 - Nobyembre 9, 1970) usa nga Franses nga heneral ngan lider politikal. Hiya an mangulo han Fransya tikang 1959 kutob 1969. Cogan, Charles. 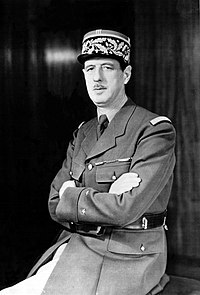 Charles de Gaulle: A Brief Biography with Documents. (1995). 243 pp. Crawley, Aidan (1969). De Gaulle. London: The Literary Guild. Ledwidge, Bernard (1982). De Gaulle. London: Weidenfeld and Nicolson. ISBN 0-297-77952-4. Shepard, Todd. The Invention of Decolonization: The Algerian War and the Remaking of France. (2006). 288 pp. Mahan, E. Kennedy, De Gaulle and Western Europe. (2002). 229 pp. Mangold, Peter. The Almost Impossible Ally: Harold Macmillan and Charles de Gaulle. (2006). 275 pp. Moravcsik, Andrew. "Charles de Gaulle and Europe: The New Revisionism." Journal of Cold War Studies (2012) 14#1 pp: 53–77. Paxton, Robert O. and Wahl, Nicholas, eds. De Gaulle and the United States: A Centennial Reassessment. (1994). 433 pp. White, Dorothy Shipley. Black Africa and de Gaulle: From the French Empire to Independence. (1979). 314 pp. Aussaresses, General Paul (2010). The Battle of the Casbah: Terrorism and Counter-Terrorism in Algeria, 1955–1957. New York: Enigma Books, ISBN 978-1-929631-30-8. Haine, W. Scott (2006). Culture and Customs of France. Greenwood Press. ISBN 0-313-32892-7. Saha, Santosh C. (2006). Perspectives on Contemporary Ethnic Conflict: Primal Violence or the Politics of Conviction?. Lexington Books. ISBN 0-7391-1085-3. Speer, Albert (1997). Inside the Third Reich. New York: Simon & Schuster. ISBN 0-684-82949-5. Dimitri Kitsikis, L'attitude des Etats-Unis à l'égard de la France, de 1958 à 1960. Revue française de science politique, 1966, vol.16, no.4. Ini nga pakli kataposan nga ginliwat dida han 13:14, 22 Enero 2015.